Contemporary life embraces many interdisciplinary activities in which artists and designers share their theories and practices. Both in arts as in design, good part of todaybs production has as base some concepts discussed in this publication, such as ”appropriation” and “reference”. After the postmodern questions about modern values, like the search for a future of progress and evolution, the seeking for the new, the original (that soon would run out), creative areas needed to review their presuppositions. The looks would turn into references once forgotten, they have been rescued, modified, recombined with other elements, thus theybre now providing different meanings to artifacts. Countless concepts rule these fields, however, multiple are the readings and the uses their artifacts evoke. To approach the possible meanings created, their targets must consider on matters such as: the function and contextbs deviations, the balance between authorship, appropriation, and audience’s point of view. These issues permeate the works of many Brazilian professionals operating in international scene, such as the visual artist Laura Lima and the graphic designer Rico Lins. Their works may be revisited in the documentation of an exhibition that happened during the Olympic Games of London, United Kingdom, 2012, the collective “From the margin to the edge: Brazilian art and design in the 21st century”. Laura Lima (b. 1971), was born in Governador Valadares, MG, and lives in Rio de Janeiro, RJ, shebs graduated in Philosophy and, in the 1990’s she went to the Parque Lage’s School of Visual Arts. To Laura the artist is a natural born thinker, art generates thoughts. She tries to understand the sense of everyday things and the human behavior towards objects. The philosopher artist appropriates preexisting objects and images to recompose new propositions. Rico Lins (b. 1954), was born in Rio and lives in São Paulo, SP, he’s a graphic designer and a master of arts. He believes the existent barriers between art and design instigate transgressions, stimulate the practice of creative freedom. With a repertory of forms and historical contents, he manipulates and reuses his own creations, as well as appropriates other authorbs images, and put them out of their contexts, producing other meanings. With the work of Laura and Rico, this paper intends to review theories and practices in art and in design, showing that both can operate in a very similar way, thus empowering their capacities of engender meanings by maintaining valorous exchanges. While Laura takes design to art, Rico brings art to design. Driving in a two-way road they get closer to one another and find themselves at the same exhibition space. In 2012 the organizer committee of the “Rio 2016” Olympic Games took to the Somerset House of London, the collective “Casa Brasil”, including three exhibitions, among them “From the margin to the edge: Brazilian art and design in the 21st century” (img. 01). The event had no catalogue edited, neither virtual, nor printed, to compensate its website brings images of all rooms in 360B:, in addition to audio and video archives with the participant artistbs testimonials. . The curator, teacher and, art and design historian Rafael Cardoso, explains in the intro video that the exhibition deals not only with the edges of art and design, but also the geographic, sociopolitical and cultural frontiers. To him, Brazilian production is ceasing to be bmarginalb, peripheral, to enter the center of international attentions. The exhibition had three rooms, denominated with the following binomial expressions: “Raw/Cooked” (“Cru/Cozido”), “Gambiarra/Craftsmanship” and “Preserve/Transform” (“Preservar/Transformar”). The first room asks questions about European stereotypes towards Brazilians, between the ones said ”civilized” and the “wild” ones. The second expressed the untranslatability of some words from a language, or from a culture, to another. These opposite concepts respectively correspond, one to the things called ”badly” made, improvised, and the other to the “well” made. The third room suggested a reflection about the paths to Brazil’s international relationships in the 21st century, what should be preserved and what could be transformed. 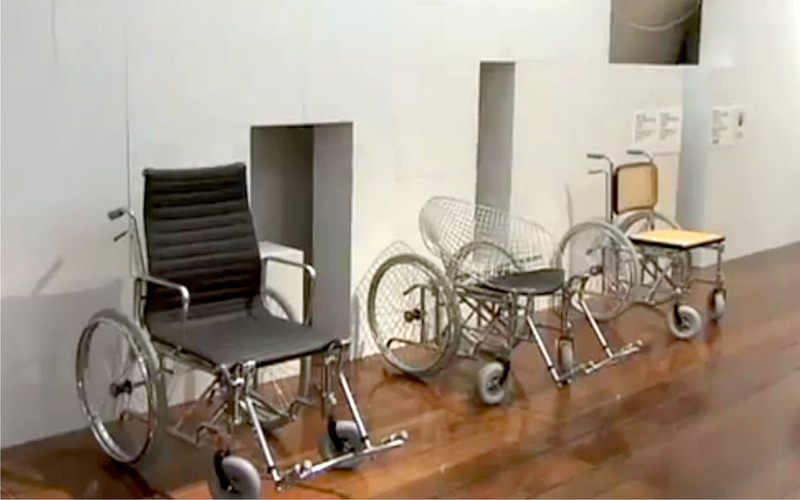 The series of wheelchairs (2012) by Laura Lima, and the series of posters ”Seja marginal, seja herói” (2012) by Rico Lins, have been presented at the “Preserve/Transform” room. They propose a kind of preservation when they quote known references and simultaneously transform some aspects of the ideas, objects or images quoted. 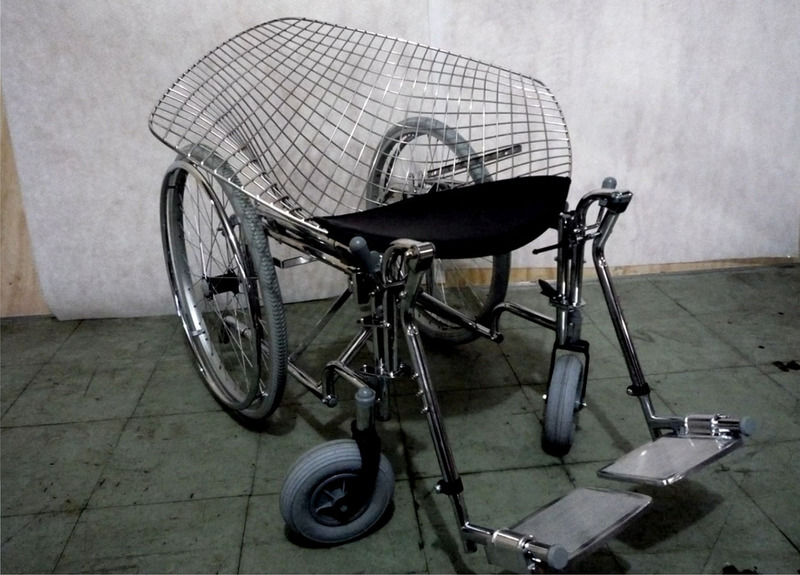 To the London exhibition Laura Lima selected three pieces from a series of wheelchairs, she stared developing some time ago, from some ”collages” she made with classic chairs of modern design: she appropriates items by Charles Eames (1907b1978 b img. 02c), Marcel Breuer (1902 -1981 - img. 02a) e Harry Bertoia (1915 - 1978 - img. 02b), and then she adds wheels to their chairs. . The artist affirms she`’s interested in the application of things’ meanings in ordinary life, she says the chairs make references to humans’ body and behavior. With this work, Laura reflects on the manners the chairs (with or without wheels) are designed, and how could they be. She approaches projectual issues, discusses comfort, functions and uses. Laura subverts the instances of industrial production (manufacturing, distribution and consumption), as argues Cardoso, “The power of resignifying the artifact is in the hands of who uses it and, from the moment itbs socially formalized to accept the new meaning, it can be extendable to a whole users’ community.”  Laura blends irony and criticism into a celebration of this resignification power, inviting her audience to rethink concepts. As dadaists, surrealists and conceptual artists, Laura inserts design products into artsb context, therefore designbs languages set artistic speeches. Laura Lima tries to reach the resignification attitude as Rico Lins proposes, for she takes images and preexisting objects to compose new pieces. Besides the chairs series, she has other works using appropriation as creative resource. In 27th Bienal de São Paulo (2006) Laura exposed the work “Ouro flexível - encontro” (2005 - img. 05b), which rescues the image of a painting by François Clouet (1515-1572), “The bath of Diana” (1559-1560 - img. 05a), a printed reproduction from a catalogue, and draws on that image with a golden pen. Image 05: “The bath of Diana” (1559-1560), by François Clouet and ”Ouro flexível - encontro” (2005), by Laura Lima  . 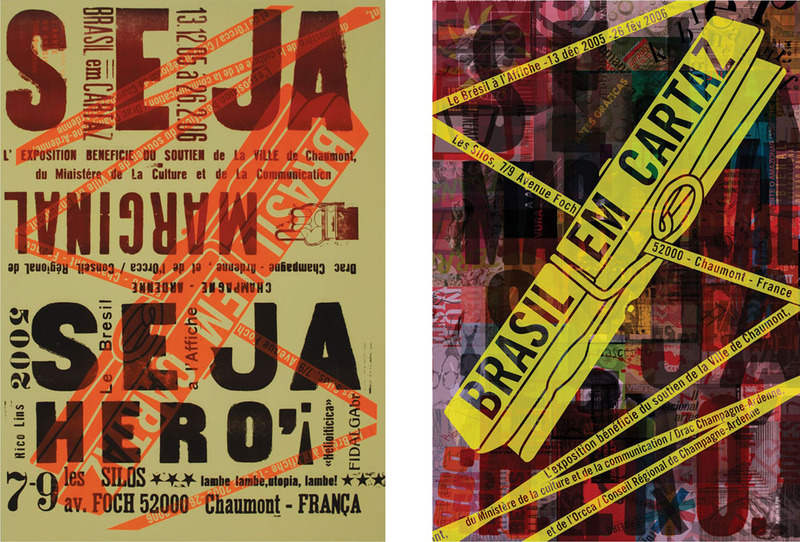 The posters Rico Lins showed in London (2012) are a reedition of a poster he created originally to the exhibition “Brasil em cartaz” (img. 06), that happened in Chaumont, France (2005). The event was a realization of the cultural center Pôle Graphisme, which invited Rico to curatorship and graphic projects of catalogue and poster. These pieces showed a diversity of techniques and references, from high art to popular culture, present in Brazilian posters. 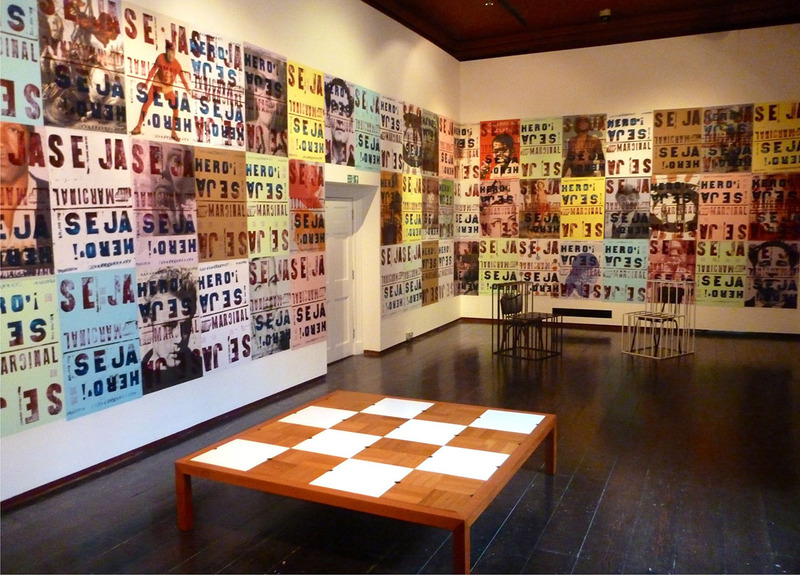 Image 06: Versions of the first edition of the poster presented in Chaumont (2005)  . Rico appropriates the phrase ”Seja marginal, seja herói”, by Hélio Oiticica (1937-1980 - img. 07) to link this poster’s marginal aspect to a blend of cultures, forms, concepts, times e processes. He overlays different printing processes: offset, silkscreen, typography. Rico and Hélio valorize transgressor attitudes and ruptures in favor of creative freedom, they defend the idea to open art/design works to popular culture and to everyday life. Cardoso included the first version of this poster in his book “Design to a complex world” (2012), where he mentions the importance of using repertories and memories in the process of language sophistication and in the construction of identity in design projects. To him, the repertory serves precisely to “introduce noises and create dissonances, as much as to support apparent meanings”. Knowing that good part of this exhibition’s target would be made of people who didn’t comprehend Portuguese language, the designer transformed the enunciation “seja marginal, seja herói” almost into a pictorial shade and graphic landscape, relativizing the denotative weight of its verbal meaning. The final i itself, from “herói” is suppressed, moving the word toward its foreigner equivalent hero (English) and héros (French). The result of all this is that the poster infers a series of different readings, from a higher or minor complexity, depending on whether the audience understands Portuguese, knows who is Hélio Oiticica, comprehend the relevance of the grid as element of visual space structuring in modernist graphic design, knows the typographical popular tradition in Brazil, and so on.  . Image 08: bPreserve/Transformb, room 6 of the exhibition “From the margin to the edge”  . In the second edition of the poster, (2012) Hélio’s phrase reappears (imgs. 08 e 09), but this time Rico overlays it with images of public people and famous characters, some of them marginalized and others celebrated by the media. When Rico emphasizes Héliobs phrase and plays with the images of these “heroes” and “marginals”, he provides new senses to the phrase, he brings to its context values related to each celebrity, as the rebellion of a lost youth that James Dean (1931b1955) helped to form, and the audacity and improvisation of José Mojica Marinsb (also known as “Zé do Caixão”, b. 1936) films, recognized director of Brazilian marginal movies (years 1960b1970). : . 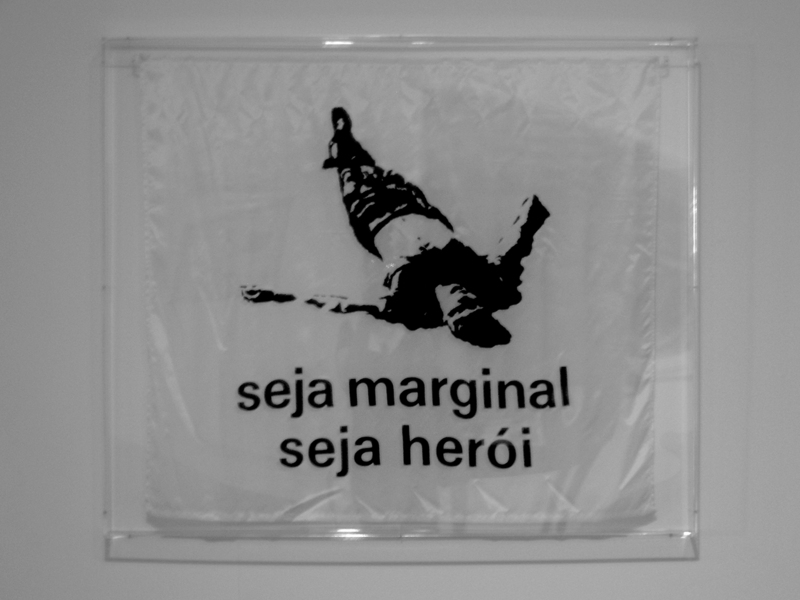 Image 09: “Seja marginal, seja herói”, 2012’s reedition  . Rico Lins drives by the same road as Laura Lima, both seek to cross borders, induce reflections, enlarge the extension of their speech, add to their works some values already evoked by other artists and designers, references from their individual repertories and consequently get closer to their audiences. Creative fields must reconcile their theories and practices if they want to engender valuable productions. Besides, histories of art and design are deeply intricate since their origins, they moved away from each other with industrial and academic rationalization, but they maintained contacts, fundamental today. When linear thinking is questioned in the early 20th century, vanguards recovered the relationships between design and art. It was perceived then, that attitudes of artists and designers can overcome the barriers of concepts established by the theories. The works of Laura Lima and Rico Lins evoke a displacement of functions and languages of art and design, they show knowledge of both areas’ essential for those who seek for an intense communication to their targets. Laura and Rico challenge their audiences, they awake a mix of nostalgia and ”déjávu”. Their projects cause inquietude, for they present images displaced from their initial context recombined with composing elements unrelated from the original. Their collages derive from their own personalities and worldviews, and still they donbt stop thinking of their public. The artist and the designer open a visual dialogue with the observers, enter their most hidden personal file at the bottom of their memories and experiences. They revive forgotten knowledges, promote researches and improvements of thinking about design and art, attitudes worthy of applauses.
. MOURCO, Raul. 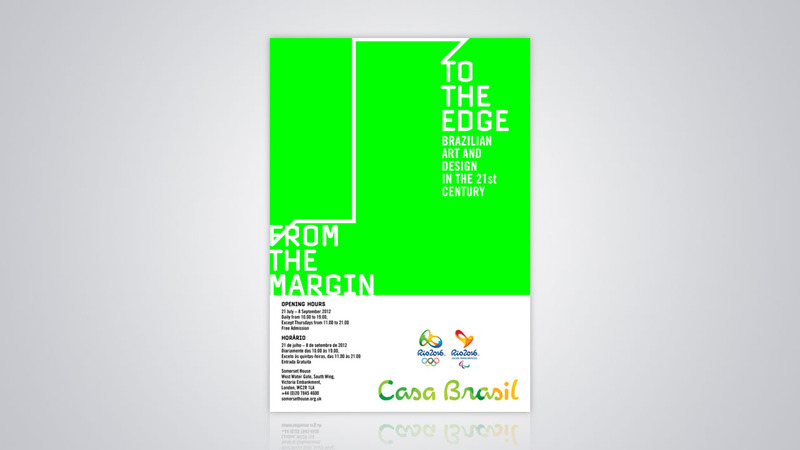 “From the margin to the edge” (2012) - exhibition poster. In: Blog de Raul Mourão. Available here. Access in: 03jul2012. CARDOSO, Rafael. CASA BRASIL: Curator gives details on the “From the Margin to the Edge” Exhibition. In: Site Rio 2016. Available here. Access in: 17abr2015. BREUER, Marcel. "Cesca side chair (model B32)" (1928). In: Site Museum of Modern Art (MoMA). Available here. Access in: 07jun13; BERTOIA, Harry. "Armchair" (1952). In: Site Museum of Modern Art (MoMA). Available here. Access in: 07jun13; and EAMES, Charles. "Side chair" (1958). Site Museum of Modern Art (MoMA). Available here. Access in: 07jun13. LIMA, Laura. Three objects from the series ”Cadeiras de rodas” (2012). In: Site Rio 2016. Available here. Access in: 20nov2012. CLOUET, François. “The bath of Diana” (1559b1560). In: Site Museu de Arte de São Paulo (MASP). Available here. Access in: 08jun13; and LAGNADO, Lisette e PEDROSA, Adriano. 2006, p. 129. LINS, Rico. “Brasil em cartaz” (2005) - exhibition posters. In: Flickr de Rico Lins. Available here. Access in: 18nov2012. LINS, Rico. In: FARIAS, Agnaldo. 2009, p. 35b36. Personal archive - photo captured in visit to the 29th Bienal de São Paulo (2010). Artists - Hélio Oiticica. In: Site 29th Bienal de São Paulo. Available here. Access in: 13abr2015. LINS, Rico. Exhibition “From the margin to the edge”, room “Preserve/Transform” (2012). In: Site Rico Lins + Studio. Available here. Access in: 19nov12. LINS, Rico. 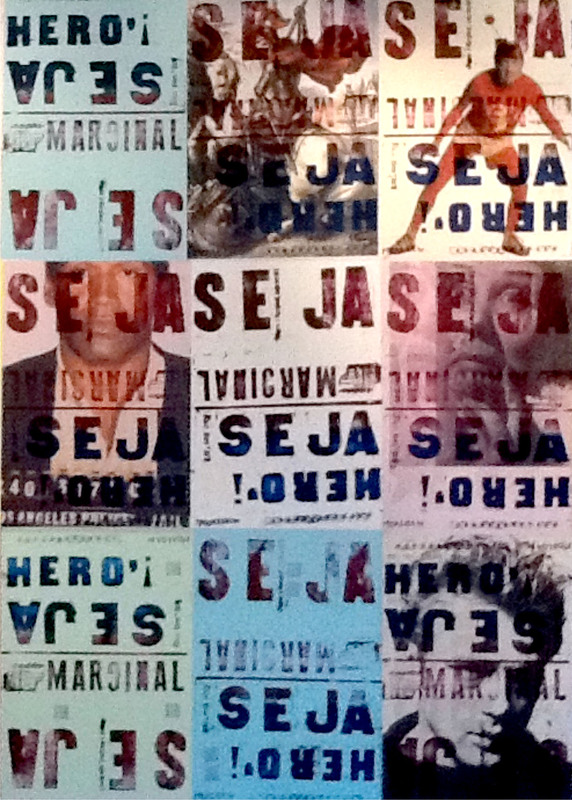 Posters from the series ”Seja marginal, seja herói”. In: Site Rico Lins + Studio. Available here. Access in: 19nov2012. CARDOSO, Rafael. CASA BRASIL: Curator gives details on the “From the Margin to the Edge” Exhibition. In: Site Rio 2016. Publication in: 09jul2012. Updated em: 03ago2012. Available here. Access in: 16abr15. _________________. Design to a complex world. São Paulo: Cosac Naify, 2012. ________________ (org.). The Brazilian design before design: aspects of graphic history, 1870-1960. São Paulo: Cosac Naify, 2005. FARIAS, Agnaldo (et al). Rico Lins : graphic borderlines. Rio de Janeiro: Solisluna Editora, 2009. LAGNADO, Lisette and PEDROSA, Adriano. 27th Bienal de São Paulo: how to live together. São Paulo: Fundação Bienal, 2006. LINS, Rico. Interview to André Stolarski. In: FARIAS, Agnaldo (et al). Rico Lins: graphic borderlines. Rio de Janeiro: Solisluna Editora, 2009. _________. Selected Texts: recicling. In: FARIAS, Agnaldo (et al). Rico Lins: graphic borderlines. Rio de Janeiro: Solisluna Editora, 2009. Daniela Souto is a master of Visual Arts (2013) and graduated in Graphic Design (2007) and Fine Arts (2001) at the Santa Catarina State University (UDESé. From 2001 to 2014 she worked as a graphic designer in marketing departments of big companies from Santa Catarina. Nowadays she is focused in independent projects of several cultural areas.